The History of Square Dancing, published by S. Foster Damon in 1957, is one of the few books that presents a broad picture of the subject. The book was a reprint of his 1952 article published in the Proceedings of the American Antiquarian Society. 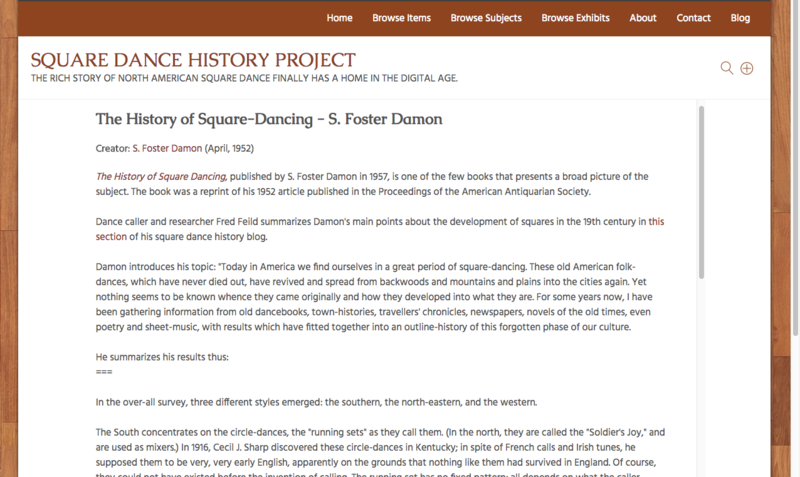 Dance caller and researcher Fred Feild summarizes Damon's main points about the development of squares in the 19th century in this section of his square dance history blog. Damon introduces his topic: "Today in America we find ourselves in a great period of square-dancing. These old American folk-dances, which have never died out, have revived and spread from backwoods and mountains and plains into the cities again. Yet nothing seems to be known whence they came originally and how they developed into what they are. For some years now, I have been gathering information from old dancebooks, town-histories, travellers' chronicles, newspapers, novels of the old times, even poetry and sheet-music, with results which have fitted together into an outline-history of this forgotten phase of our culture. In the over-all survey, three different styles emerged: the southern, the north-eastern, and the western. The South concentrates on the circle-dances, the "running sets" as they call them. (In the north, they are called the "Soldier's Joy," and are used as mixers.) In 1916, Cecil J. Sharp discovered these circle-dances in Kentucky; in spite of French calls and Irish tunes, he supposed them to be very, very early English, apparently on the grounds that nothing like them had survived in England. Of course, they could not have existed before the invention of calling. The running set has no fixed pattern; all depends on what the caller thinks of next. In the North-East, the squares are based on swinging, and include the noisy kick-balance. The contras also have been preserved; there are still communities which dance little else. Ralph Page, the expert caller, has done much to spread them; it is said that they are beginning to be found outside New England again. In the West, the squares are faster than in the East, and are more complicated. Where the easterner would swing, the westerner is content with a do-pa-so. 43 A number of other new figures would seem to have originated here. But wherever it is found, the American square-dance has grown from its historical roots into something like nothing to be found elsewhere in the world. It has the advantages of being both a survival (in the country) and a revival (in the city)-the living, free tradition of the one combined with the enthusiasm of the other. It is living, in the sense that it is growing, developing. The variety of patterns is already extraordinary. Yet they all follow more or less the pattern of popular song: introduction, four stanzas, chorus, and an occasional coda. Where the old squares would combine a couple of motifs and call it a number, the modern squaare uses a single motif and develops it. The result is an artistic unity that did not exist before. And as the modern generation is frankly athletic, the dances are quite vigorous. 43- Originally miscalled a "do-si-do," it has acquired a variety of different names in the past few years. The step consists of a left-hand round your partner, right-hand round your corner, and repeat as long as the caller calls it. 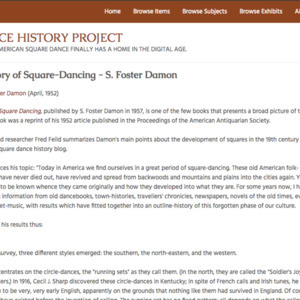 S. Foster Damon, “The History of Square-Dancing - S. Foster Damon,” Square Dance History Project, accessed April 25, 2019, http://squaredancehistory.org/items/show/1185.